The deal was signed in 2012 between Canadian Commercial Corporation (CCC), an agency of the Crown, and the government of Saudi Arabia, for use by Saudi Arabia’s National Guard. In support of previous sales of similar vehicles made by General Dynamics’ plant in Sterling Heights, Michigan, Saudi Arabia’s National Guard “needed these defense articles so that it can effectively conduct security and counter-terrorism operations”. Originally, it appears that 928 vehicles were ordered. About a third were standard troop carriers, while 119 were to be equipped with yet-to-be-designed 105 mm anti-tank cannons. The remaining vehicles were to be equipped with light-duty firepower, or serve as ambulance carriers, command posts, and other specialized uses. CBC obtained documents that suggested that in 2017 the order quantity was scaled back to 742 units. In October of 2018, Mr. Trudeau said that losing the deal would cost Canada a billion dollars in penalties, but also said that his government could freeze exports for certain weapons if it found they’d been misused. It has since come to light that cancellation penalties could well amount to several billion dollars. The contract is shrouded in secrecy, as a result of which one can only speculate on the size of the potential penalties. The first two generations of LAV were produced by GM Diesel Division in London, Ontario under an agreement with the Swiss firm MOWAG. In the late 1990s, GM bought MOWAG and with it the rights to the family of vehicles. More recently, the plant was bought by General Dynamics Land Systems (GD), and continues to produce LAVs along with a number of other armoured vehicles. The company is tight-lipped about its operations and contracts, but in a 2012 interview with Canadian Defence Review revealed that it had 2,400 employees in Canada, including 700 engineers, that more than 80 per cent of its production is destined for export markets, and that in addition to its own operations, it does business with more than 400 Canadian suppliers that are located in all ten provinces. 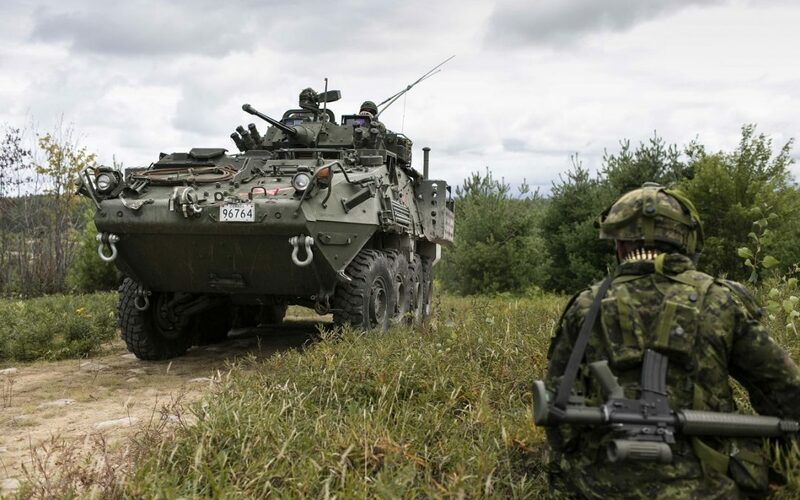 Furthermore, it claimed to be a world leader in the design, manufacture and support of armoured vehicles for domestic and international defence markets, and that it is one of few Canadian defence companies that is a major platform provider, systems integrator and developer, and owner of intellectual property. Given that Mr. Khashoggi’s murder had nothing to do with GD’s armoured vehicles, Mr. Trudeau’s talk of interfering with the contract is highly surprising and, in the context of recent adverse developments in Canada’s major export industries (oil and gas, and automobiles), is most concerning. How many more industries can we afford to see pummeled before we will see negative impacts on our standard of living? Canada’s defence industry is much larger than most people think. The Canadian Association of Defence and Security Industries (CADSI) represents more than 900 Canadian defence and security companies that produce goods, services and technologies made across Canada and, CADSI claims, contribute to the employment of more than 60,000 Canadians and generate $10 billion in annual revenues, roughly 60 per cent of which come from exports. Don’t get me wrong: I don’t think many Canadians support the sale of military equipment to rogue regimes. As noted above, the Canadian government has rules in place that govern the sale of such equipment, and those rules have been judged to be a reasonable compromise for decades. That said, most nations that are based on strong democratic principles have their own defence industries, and are unlikely to purchase defence systems from Canada. As a result, Canada will typically be a subcontractor to foreign integrated defence contractors, or will sell systems to smaller nations that are not necessarily grounded on a firm footing of democracy. And even those who are may occasionally see benefit in abrogating the rules. In other words, anyone selling hardware, software or technology for use in weaponry may discover that the terms of its sales have been violated, and find that the goods and/or services have been used to quell resistance to the regime. Armoured vehicles are designed to transport government troops and to deliver firepower in support of those government troops in domestic or international conflict areas and, despite our best efforts, there are no absolute guarantees that they will only be deployed under circumstances that we would deem to be “legitimate”. As a further illustration of the inherent risks of exporting sensitive technology, the government of India purchased a Canadian CANDU nuclear reactor, and in 1974 used plutonium produced by the reactor to detonate a nuclear test bomb. Canada broke off all nuclear collaboration, but could not prevent the inappropriate use of a commercial reactor. And so it is with export of any military technology. As a country, we need to do some soul-searching as whether we are comfortable with the existing rules, or whether those rules should be modified. In conjunction with our Allies, we have a system in place that should prevent the export of sensitive hardware, software and technology to non-approved countries, and in addition to those, we have placed additional restrictions on exports of sensitive items. Should those arrangements be modified? Our quest for economic diversification, in an effort to reduce Canada’s reliance on natural resources, has by and large had weak results, has taken many decades, and has not increased the fundamental strategic strength of our economy. We have suffered very significant setbacks to our efforts, which we have yet to overcome. As examples, I would like to mention the demise of such flagbearers as Nortel and Blackberry, which represented grave blows to Canada’s nascent technology sector. Going back further in time, the government’s decision to stop funding the Avro Arrow combat fighter project in the late fifties, and to order the physical destruction of prototypes, blueprints and anything that might allow the “resurrection” of this world-class fighter jet, was a blow that Canada’s aerospace industry never survived from. Sadly, Bombardier’s advanced C-Series aircraft has recently become part of Airbus’ product lineup, with corporate design, manufacturing and sale decisions most likely made in Toulouse, rather than Montreal. Mr. Trudeau should tread carefully: an inappropriate emotional reaction to Mr. Khashoggi’s unlawful death is no reason to create unpredictability and uncertainty within Canada’s defence industries. Other pronouncements by Mr. Trudeau before and after his election (for example: “No more pipelines”) have created havoc in important industries that, ultimately, have deprived Canada of billions of dollars of tax revenues that could have been used to shore up its flagging finances and underpin existing social programmes. No one in Canada will benefit from reduced industrial activities. For the month of December of 2018 Canada recorded a record trade deficit of $4.6 billion. For a country that sees itself as an exporter to the rest of the world, this is a pathetic performance. In addition, Canada recorded a record current account deficit of $59.7 billion in 2018 (the current account deficit represent a country’s net trade in goods and services, it net earnings on cross-border investments, and its net transfer payments). Furthermore, labour productivity during Q4 of 2018 suffered 0.4 per cent, as more labour hours were spent producing an identical volume of output, compared to the previous quarter. Given the challenges facing Canada’s two most important industries, oil and gas production and automobile manufacturing, Canada simply cannot afford to be indifferent about its defence exports. It is quackery to suggest we can continue to enjoy a relatively high standard of living while being unable to generate sufficient income from exports to pay for our imports. Furthermore, at the time of this writing, it appears that China may be contemplating trade retaliation against Canada (see following article) which would exacerbate an already precarious international trade situation. After 50 years of diddling about economic diversification, with no meaningfully positive results, and with major developments on our doorstep that will reduce demand for unskilled or low-skilled labour, there needs to a serious discussion about which industries Canada wishes to support, and how Canada intends to support the large numbers of people that may be made redundant because of automation during the next decade.